Kyle Grillot - kgrillot@shawmedia.com Kailey Bickner, 13, of Wauconda (from left), Mollie Immens, 14, of Fox River Grove and Cara Larson, 13, of Barrington together at the top of the ski jump during a training session Thursday at Norge Ski Club in Fox River Grove. 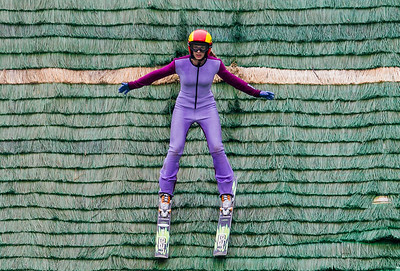 These girls make up three of the eight girls selected to participate in the Women's Ski Jumping U.S.A Fly Girls development camp this summer. Kyle Grillot - kgrillot@shawmedia.com Kailey Bickner, 13, of Wauconda prepares to jump during a training session Thursday at Norge Ski Club in Fox River Grove. 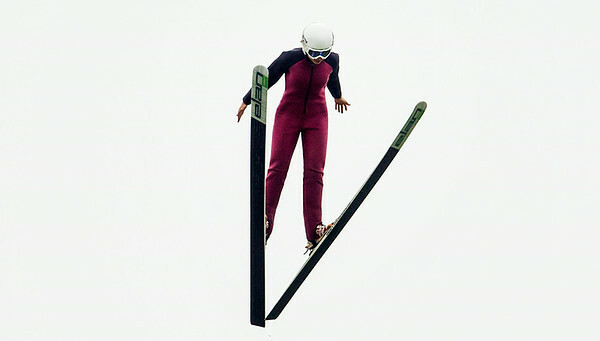 These girls make up three of the eight girls selected to participate in the Women's Ski Jumping U.S.A Fly Girls development camp this summer. Kyle Grillot - kgrillot@shawmedia.com Cara Larson, 13, of Barrington (from left), Kailey Bickner, 13, of Wauconda, and Mollie Immens, 14, of Fox River Grove carry their skis to the top of the ski jump during a training session Thursday at Norge Ski Club in Fox River Grove. These girls make up three of the eight girls selected to participate in the Women's Ski Jumping U.S.A Fly Girls development camp this summer. Kyle Grillot - kgrillot@shawmedia.com Kailey Bickner, 13, of Wauconda climbs to the top of the ski jump during a training session Thursday at Norge Ski Club in Fox River Grove. These girls make up three of the eight girls selected to participate in the Women's Ski Jumping U.S.A Fly Girls development camp this summer. 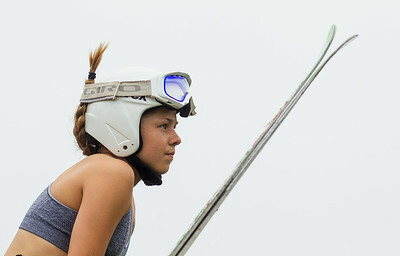 Kyle Grillot - kgrillot@shawmedia.com Cara Larson, 13, of Barrington prepares to jump during a training session Thursday at Norge Ski Club in Fox River Grove. These girls make up three of the eight girls selected to participate in the Women's Ski Jumping U.S.A Fly Girls development camp this summer. Kyle Grillot - kgrillot@shawmedia.com Cara Larson, 13, of Barrington and Mollie Immens, 14, of Fox River Grove carry their skis to the top of the ski jump during a training session Thursday at Norge Ski Club in Fox River Grove. These girls make up three of the eight girls selected to participate in the Women's Ski Jumping U.S.A Fly Girls development camp this summer. Kyle Grillot - kgrillot@shawmedia.com Cara Larson, 13, of Barrington is airborne while jumping during a training session Thursday at Norge Ski Club in Fox River Grove. These girls make up three of the eight girls selected to participate in the Women's Ski Jumping U.S.A Fly Girls development camp this summer. Kyle Grillot - kgrillot@shawmedia.com Cara Larson, 13, of Barrington listens to her coach's advice during a training session Thursday at Norge Ski Club in Fox River Grove. These girls make up three of the eight girls selected to participate in the Women's Ski Jumping U.S.A Fly Girls development camp this summer. Kyle Grillot - kgrillot@shawmedia.com Kailey Bickner, 13, of Wauconda is airborne while jumping during a training session Thursday at Norge Ski Club in Fox River Grove. These girls make up three of the eight girls selected to participate in the Women's Ski Jumping U.S.A Fly Girls development camp this summer. 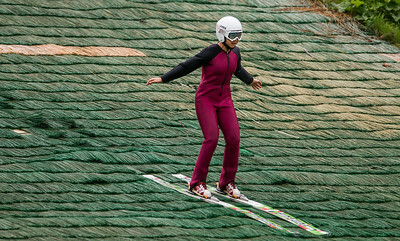 Kyle Grillot - kgrillot@shawmedia.com Mollie Immens, 14, of Fox River Grove rides down the ski jump during a training session Thursday at Norge Ski Club in Fox River Grove. These girls make up three of the eight girls selected to participate in the Women's Ski Jumping U.S.A Fly Girls development camp this summer. Kyle Grillot - kgrillot@shawmedia.com Cara Larson, 13, of Barrington lands a jump during a training session Thursday at Norge Ski Club in Fox River Grove. These girls make up three of the eight girls selected to participate in the Women's Ski Jumping U.S.A Fly Girls development camp this summer. Kyle Grillot - kgrillot@shawmedia.com Mollie Immens, 14, of Fox River Grove (from left), Kailey Bickner, 13, of Wauconda, and Cara Larson, 13, of Barrington converse while riding up to the ski jump during a training session Thursday at Norge Ski Club in Fox River Grove. These girls make up three of the eight girls selected to participate in the Women's Ski Jumping U.S.A Fly Girls development camp this summer. Kyle Grillot - kgrillot@shawmedia.com Cara Larson, 13, of Barrington reacts after a jump during a training session Thursday at Norge Ski Club in Fox River Grove. These girls make up three of the eight girls selected to participate in the Women's Ski Jumping U.S.A Fly Girls development camp this summer. Kyle Grillot - kgrillot@shawmedia.com Kailey Bickner, 13, of Wauconda, lands a jump during a training session Thursday at Norge Ski Club in Fox River Grove. These girls make up three of the eight girls selected to participate in the Women's Ski Jumping U.S.A Fly Girls development camp this summer. Cara Larson, 13, of Barrington (from left), Kailey Bickner, 13, of Wauconda, and Mollie Immens, 14, of Fox River Grove carry their skis to the top of the ski jump during a training session Thursday at Norge Ski Club in Fox River Grove. These girls make up three of the eight girls selected to participate in the Women's Ski Jumping U.S.A Fly Girls development camp this summer.